It was an incredible storm... one for the record books in many spots. This was the view from the U.S. Capitol building in D.C. where they picked up nearly 2ft. of snow. The official tally at the Dulles Airport was 29.3", which is good enough for the 2nd largest snowfall in recorded history! One of my favorite YouTube channels is Casey Neistat and I've been waiting for his #blizzard2016 video to come out... I knew he would dissappoint! He spent the day snowboarding through the streets of New York in nearly 2ft. of snow!! The visible satellite image from Sunday showed the significant snow swath from nearly 23,000 miles above the Earth's surface... Note the sharp cut-off between snow and no snow. Within the heavy snow band there were several double digit amounts with sever 1ft. to 2ft.+ amounts! The historic storm that dumped 3ft to nearly 4ft of snow across parts of the Eastern U.S. also became the 2nd largest snowfall event for New York City, dumping a whopping 26.8 inches of snow in Central Park. Interestingly, it missed the top mark by only 0.1 of an inch as the February 2006 storm still holds the top spot with 26.9 inches of snow. 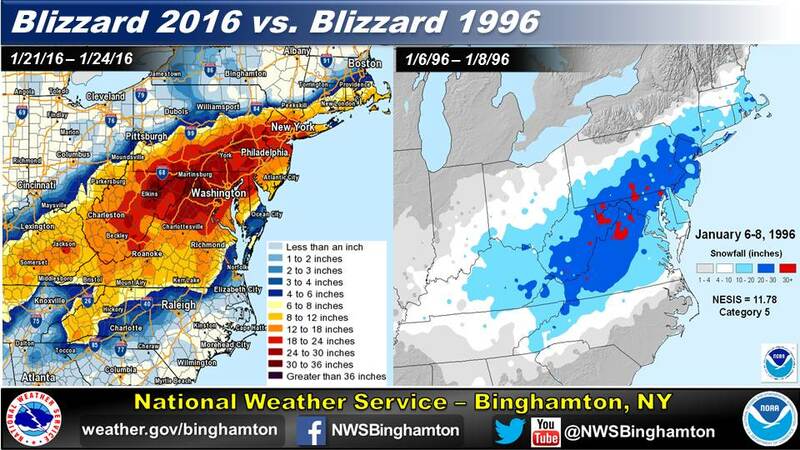 Regardless, this was a crippling event for several major cities that saw snows near the top of their records. While some in the Northeast saw nearly a whole seasons worth of snow in one storm, the seasonal snowfall deficit has grown to more than 1 foot in the Twin Cities! A weak system will scoot through the region today with a light wintry mix, which will turn to light snow later today. There will be a 1 to 4 inch band of snow setting up from eastern South Dakota to northeastern Minnesota. 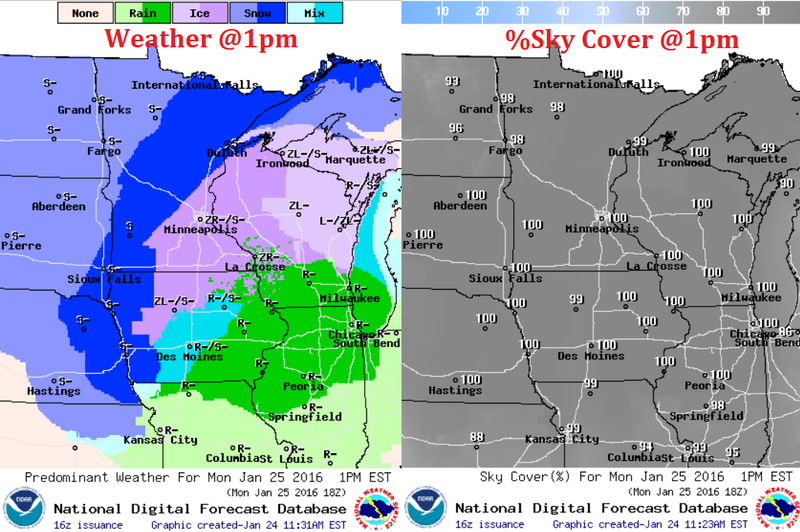 The Twin Cities might be lucky to pick up 1 inch of snow by later tonight. Our forecast then turns to a January thaw as temps climb into the 30s several times through the end of the month. .LIGHT SNOW WILL PERSIST FOR MUCH OF THE DAY INTO THIS EVENING OVER WESTERN AND CENTRAL MINNESOTA. THREE TO FIVE INCHES OF SNOW IS EXPECTED. MEANWHILE...ANOTHER AREA OF WINTRY PRECIPITATION WILL DEVELOP ACROSS SOUTHERN MINNESOTA AND WESTERN WISCONSIN THIS AFTERNOON THROUGH THIS EVENING. A LIGHT COATING OF ICE IS POSSIBLE IN THIS AREA. 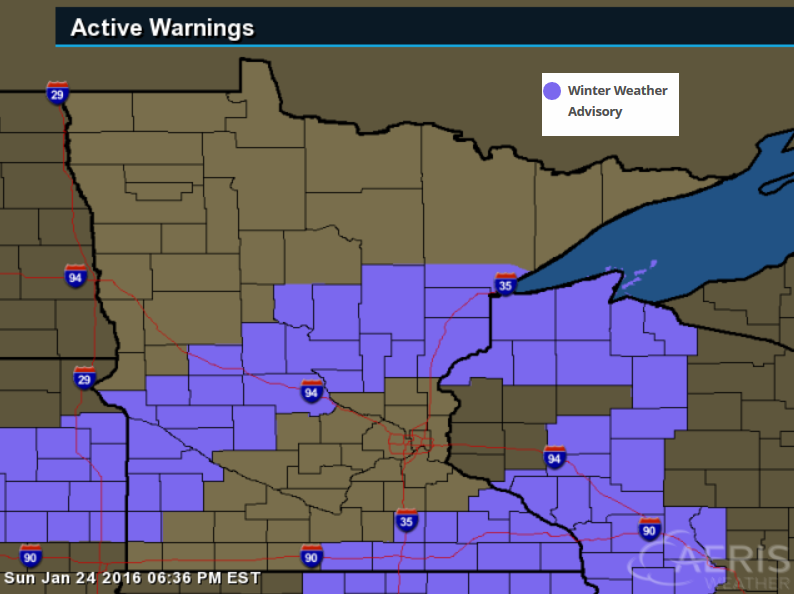 A WINTER WEATHER ADVISORY REMAINS IN EFFECT FOR PARTS OF WEST CENTRAL INTO CENTRAL MINNESOTA AND FAR SOUTH CENTRAL MINNESOTA. * EXPECT SNOW TO PERSIST FOR MUCH OF THE DAY INTO THIS EVENING THEN DIMINISH AROUND MIDNIGHT. * THE HEAVIEST SNOWFALL RATES WILL OCCUR BETWEEN 6 AM THIS MORNING AND NOON. * TOTAL SNOW ACCUMULATIONS OF 3 TO 5 INCHES ARE EXPECTED. * LOOK FOR REDUCED VISIBILITIES AT TIMES. FRIDAY: Partly sunny, January thaw. Wake-up: 25. High 34. SATURDAY: Warm for January with a light mix. Wake-up: 28. High: 37. SUNDAY: Mostly cloudy and still mild. Wake-up: 22. High: 33. 1964: A record high temperature of 64 is set at Redwood Falls. The extended temperature forecast for Minneapolis continues to suggest warmer than average temperatures continuing through the end of the week and into the first couple of days of February. However, there may be a bigger cool down as we head through the first week of February. According to NOAA's CPC, the 6 to 10 day temperature outlook suggests warmer than average temperatures across much of the Upper Midwest by the end of the month/eary part of February. These types of temperatures will feel incredibly warm compared to what we endured during the early/middle part of January. 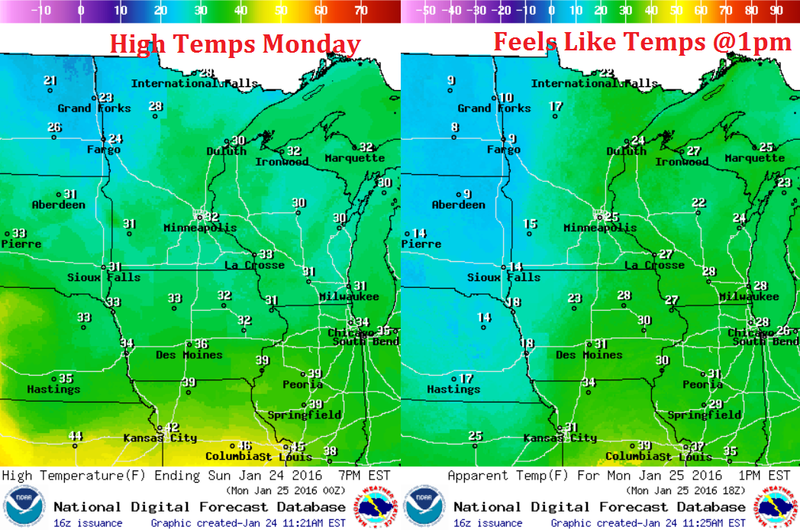 High temperatures across the region will be warmer than average once again on Monday. Highs near Minneapolis will once again flirt with the freezing mark, but a stronger wind will make it feel more like the 20s. Note the cooler air lurking across the Dakotas; feels like temperatures will be in the single digits there. 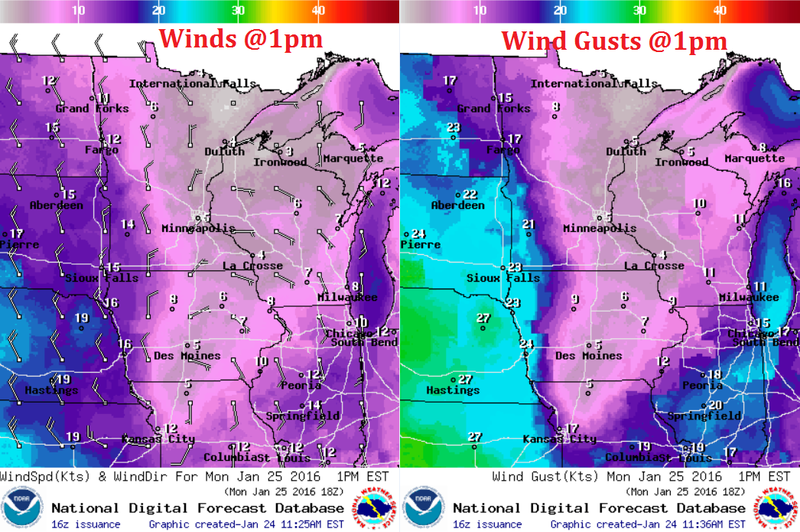 Winds will still be fairly light across the Western Great Lakes, but note the winds picking up across the Dakotas with winds gusting to near 20mph+ as our next system rolls into town. As our next weather system moves throughout the region, there will be a mix of rain, wintry precip and snow. It appears that the best chance for accumulating snow will be found from eastern South Dakota into northern Minnesota, while a wintry mix will be found across the southern MN and into parts of WI. The simulated radar from Sunday to Tuesday shows our next system pushing through the region with snow and wintry mixed conditions. Note the heavy and steadiest snowfall looks to move in from the Eastern South Dakota through Central and Northeastern MN. The snowfall potential through 6pm Tuesday suggests a fairly narrow swath of 1" to 4" of snow from Eastern SD to Northeastern MN and Northern WI. It appears that the heaviest will be just northwest of the Twin Cities, with up to 1" possible in the metro. 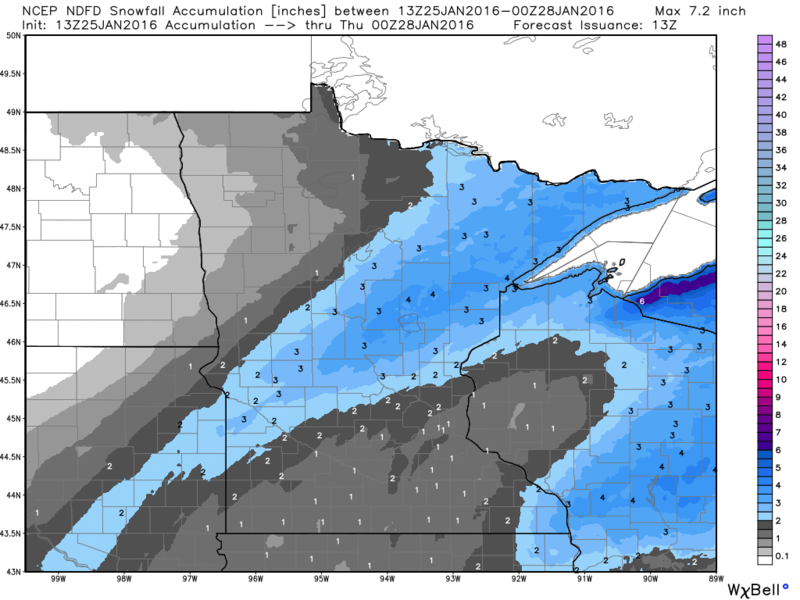 The snowfall potential for Minneapolis suggests nearly 1" of snow through Monday evening. Things have quieted down dramatically in the Eastern U.S., but another system will push through the middle part of the country through the early week time frame. Rain and areas of thunder will be found across the south, while snow and wintry precip will be found across the far north. 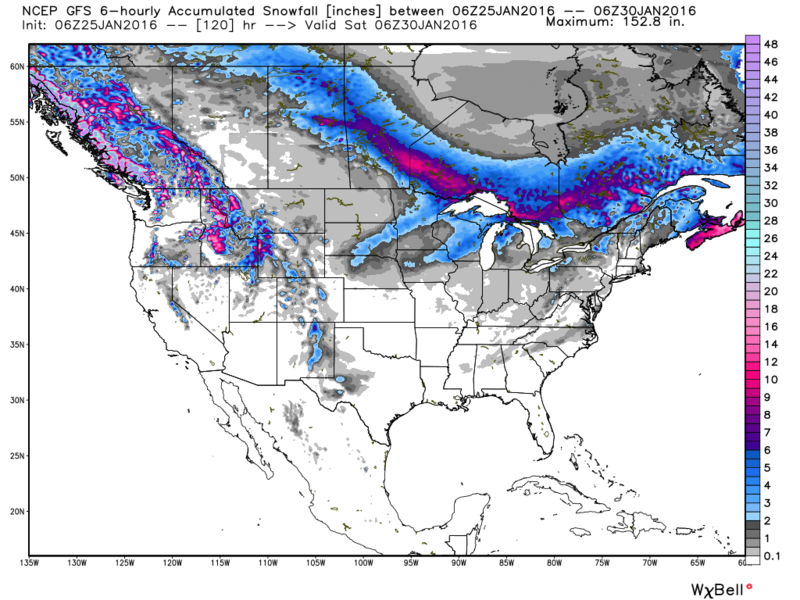 According to the 5 day GFS forecast, there will be a few areas of snow across the western U.S., mainly in the higher elevations, but there will also be a few areas of shovelable snow across parts of the Midwest and Great Lakes through the end of the week. 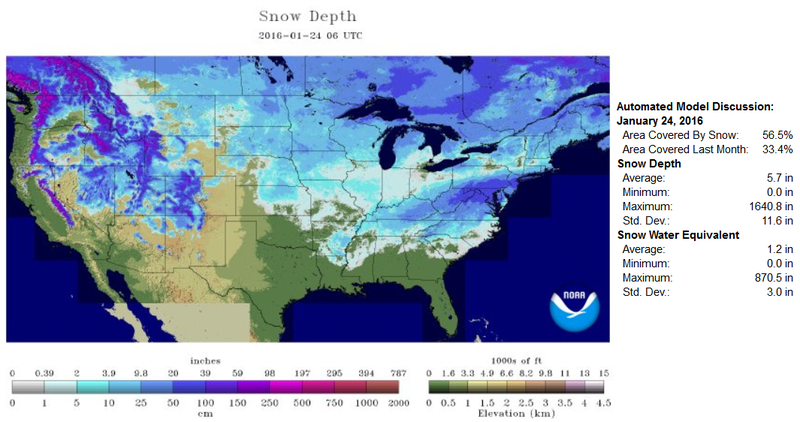 According to NOAA's NOHRSC, the national snow coverage as of Sunday, January 24th was 56.5%. Note that this last storm to impact the Eastern U.S. brought snow to places across the Lower Mississippi Valley and the Gulf Coast States. According to NOAA CPC, the 6 to 10 day temperature outlook suggests warmer than average temperature across much of the eastern half of the country. With this warming, expect to see quite a bit of snow melt next week and early February. "Taiwan, death toll rises to 52 as cold front sweeps across the island"
"52 people have died as Taiwan experiences some of the coldest weather in living memory. 36 people died in Taipei, New Taipei and Taoyuan, and a further 16 in Kaohsiung, mostly from hypothermia and the onset of cardiovascular diseases. In Taipei, the temperature fell to 4°C, the lowest level ever detected in the city in 44 years, and may drop further to 3°C early today." Forecast Calls for a Thaw - Did Unusually Mild Atlantic Water "Juice" East Coast Blizzard?